How to create a dashboard using Marchex call tracking templates? Connecting Marchex to DashThis requires only two easy steps! 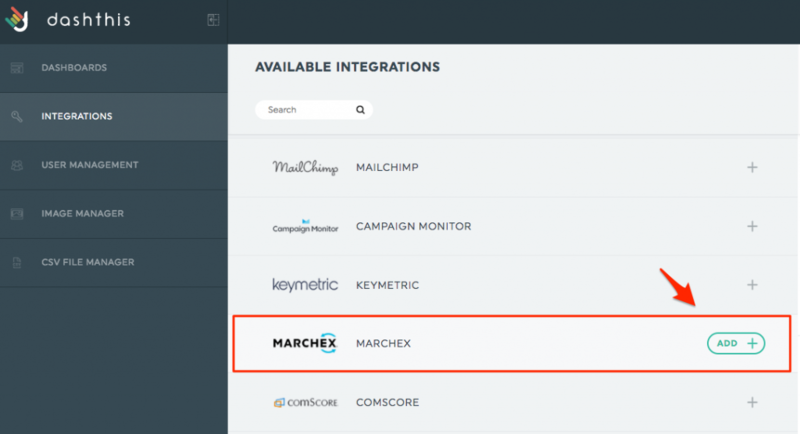 1- In the Integration Manager, choose Marchex and click on Add. 2- Enter your Marchex account credentials and click on Add. Your account now appears under the section Integrations in use. This is it! You can now add your Marchex data to your dashboards! Our support team is always there for you if you have any questions! You’re still not a DashThis user? Try our tool for free! This entry was posted in Integrations and tagged Managing Integration, Marchex. How to create a dashboard using the Smart AdServer API? How to create a dashboard using Campaign Monitor?